Did y’all know “whom” is still a word? It’s right here on page 1430 of my Webster’s. 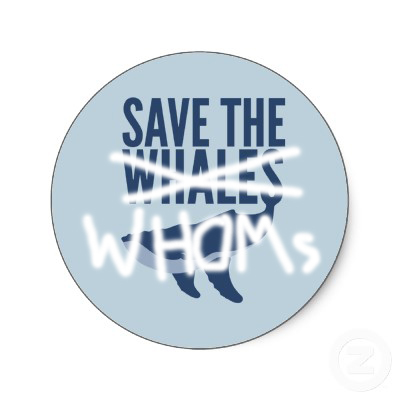 I’d like to ask all y’all reading this to help me start a grassroots campaign to bring back “whom”! Not sure when or how to use it? It’s pretty easy: When you’re writing a question, and you can’t decide if it should be “who” or “whom,” just answer the question! Your answer will point you in the right direction. Q: Who/Whom do you love? A: I love him. If it’s the subject of the sentence—the person doing the action—use “who”! If it’s an object—the person receiving the action—use “whom”! You, WWS, can be my music expert! I’ll stick with what I know: grammar, alcoholic beverages and the South. This entry was posted on July 31, 2012 by The Grammar Belle in Don't Make Me Beg, Grammar Dilemmas, When Spellcheck Won't Help.